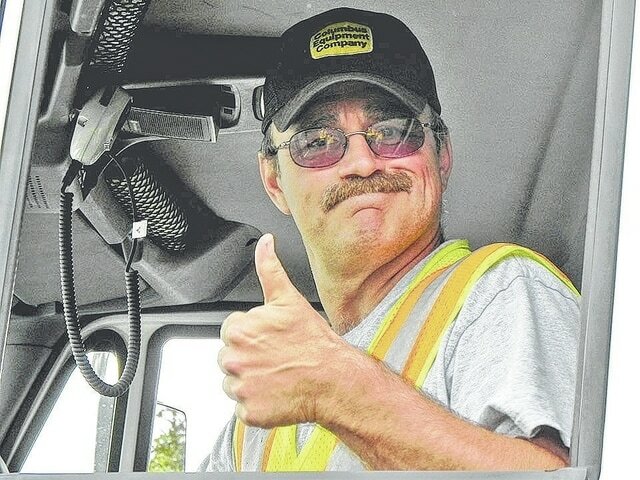 Highland County’s Chris Fulton is pictured at the start of his run in the truck competition of the ODOT District 9 Roadeo. Fifty-six employees from the Ohio Department of Transportation – District 9 showed their driving muscle last week as they participated in the district’s 2015 Truck and Loader Roadeo Competition at the Scioto County Highway Maintenance Facility in Lucasville. Created in 1988, the Roadeo is held every spring in ODOT’s 12 districts as a means to recognize and test the employees who operate some of the state’s heaviest equipment. Through a series of tests and a driving course of clearances, serpentines and stops, the Roadeo is a challenging competition that measures the skill level of participating highway technicians and mechanics. This year, the winners in both the truck and loader competitions hailed from Brown County, as Aaron Moran won the truck division and Jamie Watson won the loader. Chris Fulton from Highland County and Josh Havens from Pike County finished second in the truck and loader divisions, respectively. Rounding out the top six in the truck competition were Garold Cox and Kyle Hankins, both of Lawrence County; Trenton Otworth of Scioto County; and Glenn Fisher of Brown County. Garold Cox (Lawrence County) and Aaron Moran (Brown County) were joined by Highland County’s Parker Foust and Graham Bartram to round out the top six finalists of the loader division. Moving forward to compete in the statewide Director’s Cup of the ODOT Truck and Loader Roadeo to be held in September, Moran and Fulton will represent District 9 in the truck competition, while Watson and Havens will participate in the loader division.